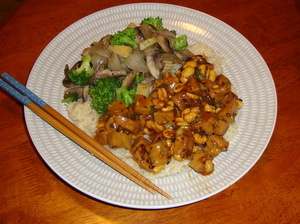 are stir-fried in a spicy Szechuan sauce with dry roasted peanuts. Mix together the marinade ingredients in a zip-lock bag. Add the chik’n, seal and shake to coat. Set aside while you prepare the rest of the recipe but shake occasionally to redistribute. Combine the ingredients for the sauce in a small dish, whisking well to ensure the starch is fully dissolved. Set aside. Thinly slice the garlic and set aside in a bowl with the grated ginger and diced green onions. In a wok or deep skillet, add the vegetable oil and 1 tsp sesame oil and place over medium heat. When hot, add the red pepper and black pepper and sauté about 30 seconds. Add the chik’n including any marinade and sauté for about 4 minutes until the chik’n is lightly browned. Add the ginger, garlic and green onion mixture and sauté an additional minute or two. Add the sauce, toss well, and sauté until the sauce begins to thicken. Serve immediately with jasmine rice.